With a continued growth in sales driven by the company’s commitment to a price freeze for 2015, customer-friendly supply agreements and future-proofing product improvements, Britain’s fastest growing composite door manufacturer DOORCO has embarked upon a recruitment drive. A move into larger premises close to DOORCO’s original Macclesfield, Cheshire base has allowed the doors to be flung open for talented people in all departments including Logistics/Distribution, Buying/Purchasing, Sales, Customer Service, I.T. and Finance. Interested applicants write to Dan or Jayne at info@door-co.com or call 01625 428955. Price rises in any market are a contentious issue and the UK window and door home improvement market is no exception. The general response to any increase is emotive, and generally the response by the buyer is not a positive one. Price rises are being imposed by some composite door manufacturers but at DOORCO we are guaranteeing our prices until at least the end of 2015. So how can one company hold its prices whilst making improvements to their products, whilst others rush to increase theirs? DOORCO, formerly Capstone, began an investment programme just over 2 years ago that was focused on producing a new breed of composite door, with more benefits and features incorporating smarter door designs, with improved security features. That investment is now paying off, with DOORCO products on the shelf and ready to provide customers all the requirements needed including the key thumb’ test, specifically PAS24 B.4.4.4 across the range. At the same time investment was made in manufacturing facilities for ‘prepped’ doors; edge banded, painted and so forth, of better quality and produced more efficiently. During that time we have also focused on sales and marketing, to reach more potential – and actual – customers. We have therefore enjoyed very significant growth, which of course increases the volumes that we take from our core suppliers. Which in turn helps our negotiations with them on the prices at which they sell their products to us. Currency exchange affects all of us and sterling has been on a roller coaster over the past few months; add that unpredictability to lowering oil prices and calculating a price list in advance can be a nightmare. Unless of course you have prepared for it; which is substantially why we have done what we have done. Our investment, which was very substantial, was partly based upon calculations that would allow us a margin for changes that were out of our control – every company of course will try and do that – and we and more importantly our customers, are enjoying the fruits of that in the current period. Customers make a judgment on from whom and where they buy their goods. We hope the improvements and cost savings DOORCO have made help us to keep our existing customer base and find new customers looking for a different approach. DOORCO faces similar pressures on the cost of its raw materials. The difference, in my view, is down to the management styles of the individuals and, of course, to key decisions taken regarding future investment and further improvements, for which healthy profits must be made. We have very positive plans for continuing along the path that has brought us to the position of strength that we find ourselves in today. We will focus on the improvements to our doors over our competitors, whilst remaining competitively priced. In a bold move that is bucking the trend amongst the leading composite door manufacturers in the UK, DOORCO has announced that it is fixing prices whilst also offering significantly improved security performance, across the company’s entire range. Offering substantially increased resistance to forced entry and violent attack as well as a more substantial feel, the modified, thicker skins that have been added as standard across all products anticipate the introduction of Approved Document Q of the Building Regulations and steal a march on most other door manufacturers that have yet to react. In addition the complete DOORCO range, including fire doors, has been tested and passes the ‘key thumb’ test, specifically PAS24 B.4.4.4. Thus, says DOORCO, the performance of its products is effectively future-proofed as they now meet all current and anticipated standards. On DOORCO’s decision to maintain prices the company’s Dan Sullivan explains: “We are able to guarantee prices for the whole of 2015 because of the significant efficiencies that we have introduced into our processes over the past 18 months and through substantial growth in the volumes we are selling. So as sales to homeowners are continuing to improve we believe that our customers – and of course DOORCO in turn – will benefit through the ability to confidently plan and predict business and margins for their door sales at least until the end of this year. Setting out its store early in 2015 DOORCO is introducing several exciting new door styles to give the trade – and in turn homeowners – a wider choice than ever with an emphasis on customisation and exclusivity. Care has been taken to ensure both traditional and modern tastes are catered for in the new products, which include four new designs which have been launched for traditional and contemporary tastes. Of the traditional styles St Andrews and Gleneagles are unique to DOORCO, whilst the Sunningdale and Belfry Farmhouse styles are manufactured from brand new moulds. Crucially this means they are not routed from a flush door, a process that inevitably weakens the panel and the usual method by which such products are manufactured. Thus, aesthetics, operation and performance are authentic and especially pleasing when installed in a traditional setting. To provide balance, at the opposite end of the styling spectrum are the new contemporary Monza, Seminole, Inox Lyon and Inox Barcelona designs. These set new parameters for modern, upmarket entrances, combining clean lines with a range of glazing options for installations in which personal expression and customisation are key. All products are available in 44mm and 68mm versions to extend appeal to a wider range of homes at all price points. Individualisation of all doors is increased through DOORCO’s in-house paint line providing an almost limitless choice of colours with fast turnaround. The new doors enjoy the reinforced skins that are standard across the whole DOORCO range. Offering substantially increased resistance to forced entry and violent attack as well as a more substantial feel, the thicker skins anticipate impending changes to the Building Regulations and steal a march on most other door manufacturers that have yet to react. The DOORCO door has been tested and passes the key thumb test, part of PAS 23/24. “As competition in the market increases and homeowners become more discerning when replacing their entrance doors,” says DOORCO’s Dan Sullivan, “we understand that we need to provide our customers and in turn their customers, with greater choice and higher quality. “These are the first of a range of new designs that will be introduced throughout 2015 to ensure that our fabricator and installer customers always have something fresh to offer, to allow them to stand out from the crowd in a busy market. “The investment we have made during the past two years has led us to this point, where we continually innovate to bring something fresh to the market, in volume slab supplies just as readily as prepped doors. The choices we are offering are designed to create excitement amongst homeowners choosing a GRP door for their properties. “We have a lot more to offer throughout this year,” adds Dan. “We are door specialists – hence the name – and we promise continual door product innovation throughout 2015. With the New Year Celebrations still fresh in the mind DOORCO is introducing several exciting new door styles to give the trade and in turn homeowners a wider choice than ever. Care has been taken to ensure both traditional and modern tastes are catered for. For the traditional four new designs have been launched. Of these St Andrews and Gleneagles are unique to DOORCO, whilst the Sunningdale and Belfry Farmhouse styles are manufactured from brand new moulds, not routed from a flush door a process that inevitably weakens the panel. Thus, aesthetics, operation and performance are authentic and especially pleasing when installed in a traditional setting. At the opposite end of the styling spectrum are the new contemporary Monza, Seminole, Inox Lyon and Inox Barcelona designs. These set new parameters for modern, upmarket entrances, combining clean lines with a range of glazing options for installations in which personal expression and customisation are key. All products are available in 44mm and 68mm versions to extend appeal to a wider range of homes. Individualisation of all doors is increased through DOORCO’s in-house paint line providing an almost limitless choice of colours with fast turnaround. The new doors enjoy the reinforced skins that are standard across the whole DOORCO range. Offering substantially increased resistance to forced entry and violent attack as well as a more substantial feel, the thicker skins anticipate impending changes to the Building Regulations and steal a march on most other door manufacturers that have yet to react. “We believe that homeowners are increasingly discerning in their choice when replacing their entrance doors,” says DOORCO’s Dan Sullivan. “These are the first of a range of new designs that will be introduced throughout 2015 to ensure that our fabricator and installer customers always have something fresh to offer, to allow them to stand out from the crowd in a busy market. The ‘DOORCO’ stand at this year’s FIT Show implied that a new exhibitor was taking part selling a wide range of composite residential doors and also featuring a nicely appointed FS, or Folding Sliding door. It was an impressive display and exhibitors and visitors alike looked on bemused at this apparent new kid on the block. Capstone remains a key, core product under the DOORCO umbrella, the company continuing under the ownership of Dan Sullivan who together with partner John Collins has been involved with the domestic door market for many years. Their initial business was supplying container quantities of Capstone doors to large fabricators then expanding into door distribution from UK stocks. In the last 18 months the offer has included a pre-prepared product, something that has dramatically increased the customer base as well as margins, simply by adding value. The company’s investment in achieving this has been substantial with a spend of more than £500,000, resulting in the factory becoming one of the most advanced composite door facilities in the country. Two CNC machines, an edge bander and a paint line allow DOORCO to offer an almost limitless customisation service to its customers. In addition to manufacturing personnel the support and management team has also doubled in size to ensure that the company has the right technical, administrative and financial skills. At this year’s FIT Show, the company rolled out new products that included a 68mm rebated composite door solution and a folding sliding door system manufactured in aluminium. Rather than use the bi-fold tag for the latter, Dan has reverted to a term used before these doors became popular in the past couple of years, one that actually is more descriptive and appropriate: “Folding/Sliding or ‘FS’ is another way of distinguishing DOORCO’s products from those of our competitors,“ he says. A more recent innovation that both illustrates DOORCO’s continuing commitment to both Capstone and to innovation is the DOORCO 6/4 Combi, a composite door that allows fabricators to make seven popular door styles from just one door blank. Manufactured using a unique midrail that has the woodgrain pattern running through from top to bottom, the 6/4 Combi may be manufactured into a number of popular styles including: Six Panel Solid; Twin Vertical; Twin Top; Twin Top with Mid Panel; Half Glazed; Full Glazed; and Four Glazed (twin and bottom). 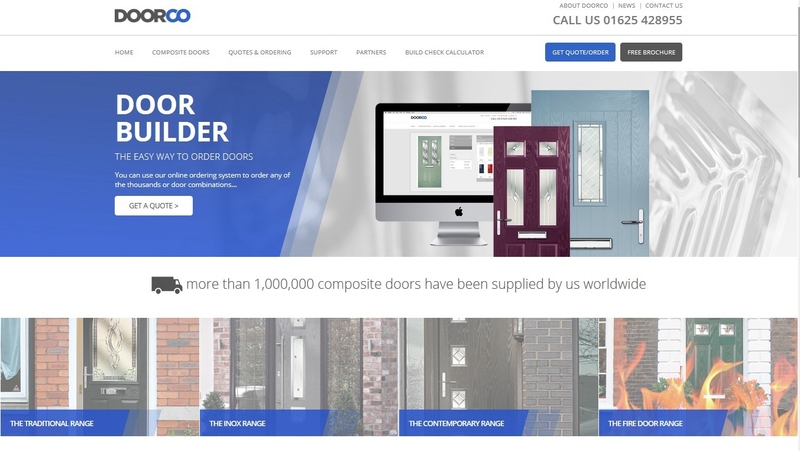 DOORCO, the Macclesfield based door specialist, is reporting a 3-year high in sales of the company’s popular Capstone 68mm product across both blanks and prepped supplies. The first 68mm composite panel to be brought to market by a major brand it was offered originally as a premium door. However, the significantly higher thermal, weather and security performance, coupled with ease of fitting and adjustment has broadened the appeal of the Capstone 68mm as installers and in turn homeowners realise the value for money the option presents. DOORCO, renamed in mid 2014 from Capstone Doors Ltd as the company’s range of door types blossomed, has also continuously boosted available stock to include 6 panel; 4 panel long; 4 panel blank; Craftsman; 3/4 lite; and flush versions, as blanks or prepped product. ODL’s Trisys cassettes are provided to offer superb choice, excellent air and water resistance and the ability to re-glaze. Prepped doors are available for Winkhaus’s excellent Edge Lock & Hinge System or the fine Exitex eurogroove lock edge system. Alternatively DOORCO prepares doors to replicate a PVC-U sash to utilise standard 16mm locks. 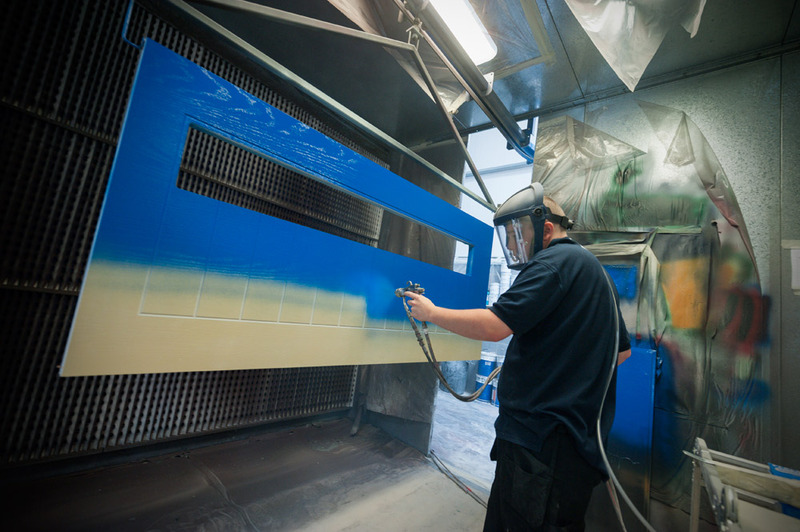 DOORCO’s offer of an almost unlimited choice and fast turnaround of colours through its in-house paint plant has attracted new customers, as has the wide selection of triple glazed units with matching sidelights. “From being offered initially as a premium product to give our customers’ additional market opportunities our 68mm range has become very popular for homes in all price ranges and sectors,” confirmed DOORCO MD Dan Sullivan. “The higher basic price of these products is nothing when the advantages and options are made clear to customers,” he added.